Brimful Curiosities: Do you buy picture books? We do! "The economic downturn is certainly a major factor, but many in the industry see an additional reason for the slump. Parents have begun pressing their kindergartners and first graders to leave the picture book behind and move on to more text-heavy chapter books." My daughter is in kindergarten this year. She just started to learn to read and has always loved books, especially picture books. Each picture book is a work of art for her, something to devour with open eyes, both the picture and the words. If a parent excludes picture books from their home library, their kids miss out on one of the most valuable forms of art for children. Pictures truly do speak a thousand words. And, if parents are no longer reading picture books with their children, both the parent and child are missing out on a wonderful bonding experience. It doesn't take any time at all to sit down together and read a short book. As far as chapter books go, just because a book is longer or contains more words does not mean it is better than a picture book or more age appropriate. In fact, many picture books are aimed at older readers. I'm still reading picture books as an adult because I enjoy the visual aspect and value the way picture books appeal to a reader's emotions. I've even seen our teenage babysitter pick up picture books in our home and read them to herself. I fully understand that new, hardcover picture books are a little pricey. But, if we expect authors and illustrators to continue to produce quality books and we value printed works, then we must also help support them in their endeavors. That means going to the library weekly and checking out new books, or purchasing a few new books for the home library every so often. Have you purchased any new picture books, lately? Which ones? Do your older children (kindergarten age +) enjoy reading picture books? Great post! I admit we buy less books now than we used to. I think there are a few reasons. I definitely used to be more eager to buy board books, partly because I hate reading library books with chewed corners (germaphobe in me) and because we didn't yet own many children's books. Now we are looking at full shelves and getting more selective. Like you say, picture books do cost more than board books. But also, now that my son is reading, he is less interested in rereading than he used to be. He still loves to reread, but he's definitely more selective. I think a good rule of thumb for us would be if he takes the same book out of the library twice, or three times, then it's worth buying. I have been thinking that I should do a picture book order soon, though. Anything by Mo Willems, in my opinion, is worth owning, for instance. The age of appeal for his books is so broad. He also seems to enjoy the Elmer books enough to justify buying some. And I love anything educational (about to post about some great math-related ones this week). Sorry, my reply got long! Not anymore. I love to review them and read them though! I have a guest post by Heather Vogel Frederick scheduled tomorrow, author of the new picture book Babyberry Pie. She discusses her favorite picture books. The great thing about picture books though is stores like Books A Million or Borders have great titles on bargain shelves all the time and you can really add to your collection. Although my kids have "moved up" to longer books, they still love to read picture books as well. I'll even catch my oldest (a ya reader) sitting by herself reading picture books. I don't see any of us outgrowing them. They're too fun! Great post. I have three children (13, 6, and 4). I do the same thing with my 6 year old that I used to do with my oldest. We read a chapter of a chapter book every night before bed, but we read at least three picture books every day. He loves both and so do I. I did this with my oldest until he was about 8 or 9. At 13, there are some picture books that he loves. My 4 year old loves picture books too. She loves to retell the story by looking at the pictures. I have to say that we don't buy many books anymore. I bought a lot of books when they were younger for the same reasons Lynn mentioned (chewed corners and germs!). Now, we borrow a lot of books from the library. We own a lot of books, but always have at least twenty out from the library. The Seven Seas about a rabbit who daydreams during his geography class. book orders are my downfall. Can't resist them, and I just signed up for them as a homeschooler, so I'm buying a LOT of books that way. I also buy used a lot, and will buy new if I'm looking for a specific book or if the price is ridiculous. I still buy them but mostly only if I have a coupon or it's at a sale. They are really pricey and my hubby has been out of work for awhile. Just want to throw out something I learned this morning: the quotes from the Amanda Gignac in the NY Times article were taken out of context, which really throws the whole story off! Yes, with 3 grandsons and a sweet granddaughter, we LOVE picture books! We love picture books and have over 500 from library book sales and garage sales and thrift stores. 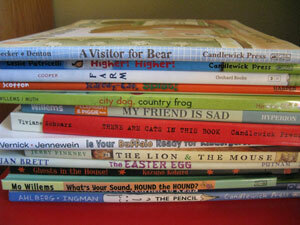 I just added 41 new picture books to our little library. Perhaps more people are buying them second hand, like me. That could explain the decrease in sales. I have noticed, though, that my kids are interested in chapter books earlier than I was; but there are a lot of picture books that are written for older kids that I never would have tried to read to my pre-schoolers. (Most of) Patricia Polacco is a perfect example. Gorgeous art and stories appropriate for middle to upper elementary school students. I adore picture books and buy a ton of them - probably the biggest category of books I buy. And I don't even have children! Have used to love books with lovely images depicting the subject, these pictures not only makes reading fun and engaging but also helps the child's brain to grasp & process information. Have to agree that these materials comes expensive but for the sake of your child's growth these kinds of books are worth the pay. I've always loved picture books! When I was younger I couldn't read very well. When I was in 4th grade I went to check out a Spot book. The librarian scolded me, and said I was too old for books like that. I was really into art, so picture books were so interesting to me. I ended up grabbing the first book off the shelf because I didn't care. It was on boxing. My mom got me into American Girl books. I liked dolls and the books were a little longer. It wasn't until I entered 5th grade that I started reading longer books. My teacher said, "Oh you can make pictures in your mind!" I tried that, and it worked. At the end of the year I was reading 500 page books. To this day the first section I go to when entering any book store is the picture book section. It's not that I can't read; it's just that they are filled with beautiful illustrations that tell a story sometimes without words. Great post! Thanks for the link! I've always skipped over the picture books, preferring books on the alphabet, colors etc. but now I have reasons to buy picture books!